From a writer with long and high-level experience in the U.S. government, a startling and provocative assessment of America’s global dominance. 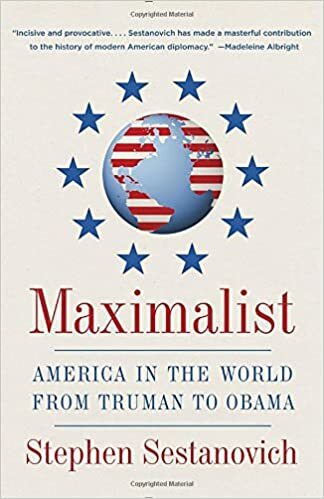 Maximalist puts the history of our foreign policy in an unexpected new light, while drawing fresh, compelling lessons for the present and future. When the United States has succeeded in the world, Stephen Sestanovich argues, it has done so not by staying the course but by having to change it—usually amid deep controversy and uncertainty. For decades, the United States has been a power like no other. Yet presidents and policy makers worry that they—and, even more, their predecessors—haven’t gotten things right. Other nations, they say to themselves, contribute little to meeting common challenges. International institutions work badly. An effective foreign policy costs too much. Public support is shaky. Even the greatest successes often didn’t feel that way at the time. Sestanovich explores the dramatic results of American global primacy built on these anxious foundations, recounting cycles of overcommitment and underperformance, highs of achievement and confidence followed by lows of doubt. We may think there was a time when America’s international role reflected bipartisan unity, policy continuity, and a unique ability to work with others, but Maximalist tells a different story—one of divided administrations and divisive decision making, of clashes with friends and allies, of regular attempts to set a new direction. Doing too much has always been followed by doing too little, and vice versa. Maximalist unearths the backroom stories and personalities that bring American foreign policy to life. Who knew how hard Lyndon Johnson fought to stay out of the war in Vietnam—or how often Henry Kissinger ridiculed the idea of visiting China? Who remembers that George Bush Sr. found Ronald Reagan’s diplomacy too passive—or that Bush Jr. considered Bill Clinton’s too active? Leaders and scoundrels alike emerge from this retelling in sharper focus than ever before. Sestanovich finds lessons in the past that anticipate and clarify our chaotic present.